Schaap Bio Energie, a Dutch farm operation and energy producer, has been turning manure and other organic material into heat, electricity and highquality fertilizer since 2007. To obtain a better return on investment, the latest biogas upgrading technology was recently installed to expand the plant, which allows Schaap Bio Energie to supply biomethane to the national gas grid. As a young agricultural entrepreneur, company owner Ids Schaap wanted to do more than just carry on his family’s 125-year-old dairy operation, so at the Schaap farm in Tirns he installed one of the first manure digesters in the Netherlands. “Branching out into biogas was attractive as it opened up a new economic perspective, provided sustainability benefits, and gave me the opportunity to help local farmers comply with environmental regulations,” Schaap said. However, producing biogas and burning it in a Combined Heat and Power (CHP) plant does not always bring the return that justifies the investment. The volume of manure and other waste streams finding their way to the Schaap farm grew faster than the local demand for heat. Ids Schaap found himself looking for a new solution that was both ecologically and economically sustainable. Anaerobic digestion produces raw biogas that consists roughly of 60 percent methane and 40 percent CO2. To upgrade biogas to biomethane the biogas is split into a methane-rich stream and a CO2-rich off-gas stream. Additional treatment is required to produce biomethane of sufficient quality for injection into the natural gasgrid or use as transport fuel. Depending on the composition of the raw biogas and legal requirements, the separation process involves drying the gas and removing trace substances such as oxygen, nitrogen, hydrogen sulfide, and ammonia. 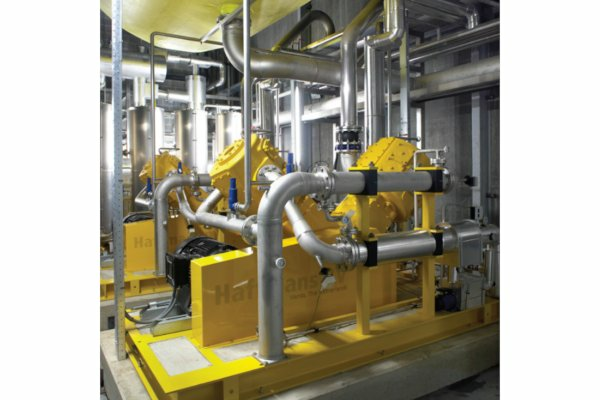 Compared to conventional upgrading technologies, Pentair Haffmans’ solution offers significant advantages. The off-gas from the first membrane process step goes to the CO2 recovery plant, where it is pressurized to 17.5 bar and cleaned in an activated carbon filter/dryer. The gas is stripped and liquefied by cooling to -24°C, while any remaining methane is fed back to the membrane unit. This unique second process step completely eliminates the environmentally-harmful ‘methane slip’, already illegal in some countries, as methane expelled into the atmosphere is 22 times more harmful as a greenhouse gas than CO2. The produced food-grade fluid CO2 is stored in buffer tanks for use in a variety of commercial applications. Biogast, a Dutch company specializing in turnkey biomethane installations, handled the project, and Biogast and Pentair Haffmans jointly developed the ideal upgrading solution for Schaap Bio Energie’s biogas. The produced biomethane has the same specifications as natural gas. To make the biomethane suitable for the national gas grid, additional treatment steps, including odorization, are required. Biogast’s Bio2Net feed-in station serves as a gatekeeper to the grid, continuously checking the volume, pressure and chemical composition of the gas. Schaap Bio Energie now produces 1.6 million m3 of biomethane per year. 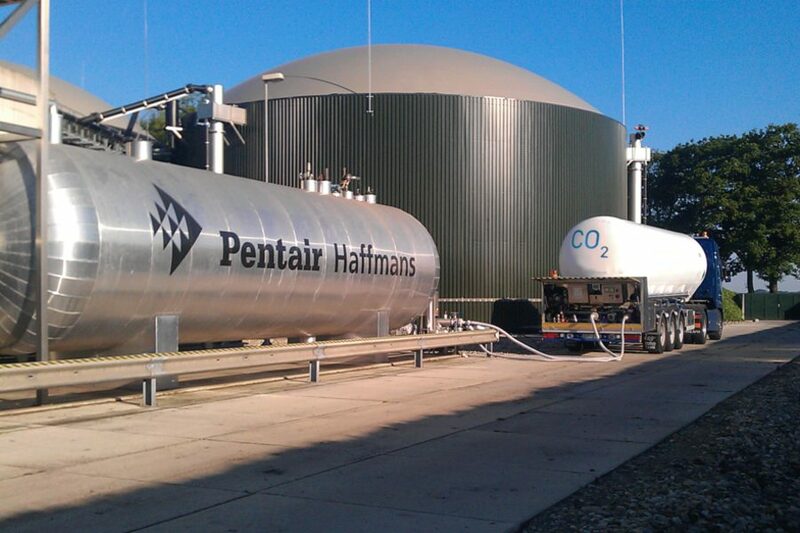 The CO2 by-product is used to provide the cooling energy needed in the biogas upgrading process. This saves electricity in the cooling unit and contributes to the plant’s overall energy efficiency. In the future, Schaap has plans to sell the produced CO2.